Has everybody forgotten who Sarath Fonseka really is? Clearly the bankrupt United National Party has. It is this same party and its current leader Ranil Wickremasinghe who accused Sarath Fonseka of the murder of Lasantha Wickrematunge. Today, Wickremasinghe and the UNP are flirting once more with Fonseka hopeful that his colourful track record will help revive an ailing party of chauvinistic stooges. Wickremasinghe in January 2009 pointed the finger for the assassination of Lasantha (and other crimes) at a team within the military-intelligence wing, albeit one operating independently of government control. “Today it is the opposition and the media who are the targets,” Ranil Wickremasinghe said in the immediate aftermath of the attack on Wickrematunge. “But a similar fate can befall the government and the cabinet tomorrow. I am talking on behalf of the entire House now,” he said. It is three years to the day since Lasantha was brutally murdered as he drove himself to work on Thursday, January 8, 2009. Elsewhere on our pages, today, we reproduce in memory of Lasantha, an editorial he carried on October 5, 2008 – three months before he was murdered where he smacked Sarath Fonseka hard for his assertions of Sinhala supremacy. At the time Army Commander, Fonseka told Canada’s National Post newspaper, “I strongly believe that this country belongs to the Sinhalese. But there are minority communities and we treat them like our people.” Gracious of him, you must admit. The Tamil and Muslim communities must be touched. Fonseka should know better, because he himself – in a supreme act of selfless patriotism – applied to emigrate to the United States, leaving his beloved Sri Lanka and his majority Sinhalese brethren. And you know what? The Americans gave him a Green Card, the technical term for which is – wait for it – a Diversity Visa. Given that the United States is 74 percent white (just as Sri Lanka is 74 percent Sinhalese), one presumes Fonseka had no qualms about being, according to his own definition, a second-class citizen there. As this newspaper said in 2008, what the likes of Sarath Fonseka simply do not get is that their parochial world view has gone out of fashion just about everywhere else. The world is becoming an increasingly small place, and one in which diversity is celebrated, not denigrated. That is why that sticker Fonseka has stamped on his passport is called a Diversity Visa. The United States welcomes oddballs – yes, even alien Army Commanders – because they feel it enriches their society. All they need is a secondary education. I recall Krishantha Cooray then CEO of the Nation newspaper loudly and angrily telling police officers and anyone who would listen that Keith Noyahr his deputy editor abducted and assaulted on May 22, 2008 was cruelly beaten up on the orders of Sarath Fonseka following an exposé Noyahr had written on Fonseka which showed him in a poor light. Two years after this attack, Cooray was to return from self-imposed exile overseas to support the candidature of Sarath Fonseka for the 2010 presidential election. He continued to back the cause of Fonseka despite Noyahr having had to flee Sri Lanka in fear for his life and that of his young family and being compelled to continue residing overseas too afraid to have to deal with the monster who ordered his assault and near death. A month later Namal Perera, a journalist with the Sri Lanka Press Institute, was ruthlessly attacked on a busy highway at Kirulapone at 5.30 p.m. as he was being driven home by a close friend – Mahendra Ratnaweera. Both Perera and Ratnaweera suffered knife wounds but the assailants failed in their attempt to abduct him. Perera too was perceived to have fallen foul of Fonseka. After the presidential election was formally declared The Sunday Leader’s management made a decision that the paper would at an editorial level broadly throw its weight behind Sarath Fonseka’s campaign. The Rajapaksa administration, by filing multiple law suits against this paper and failing to take real action in the ongoing investigation into Lasantha Wickrematunge’s murder, left The Sunday Leader’s management with no alternative. Facing devastating court cases The Sunday Leader had no option but to back Fonseka and despite my personal reservations I sympathised with the management’s position and agreed to devote a large amount of page space to the General’s campaign. What happened thereafter does not bear repetition. 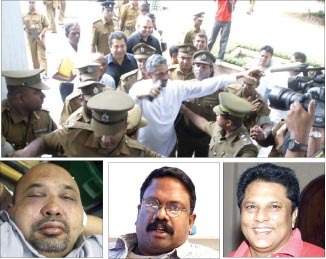 What is significant at this juncture – three years after Lasantha was killed is the hypocritical pontificating of Ranil Wickremasinghe having in 2009 accused Sarath Fonseka of the murder of Lasantha Wickrematunge which is recorded in the Hanzard. Even when the forces were recording victory after victory the present UNP leadership belittled such victories calling them names. The UNP was waiting for the forces to get routed in Kilinochchi, as predicted by Prabhakaran, to come out and brag about its political wisdom in not fighting the LTTE. That political wisdom, however, turned out to be a monumental mistake on the part of the present UNP leadership when the forces finally trounced the LTTE in all its fronts including the propaganda front which was patronised even by the UNP. After having gone through all that and finally when the UNP was reduced to a position where it badly needed some cover to hide its political stupidity they engineered another one of those ‘political master strokes’ to inveigle the heroic but politically immature and egoistic former Army Commander to become its Presidential candidate at the election that it had no hope of winning. Ranil Wickremasinghe who on Friday January 9, 2009 sat in parliament wearing a red shawl as a gag across his mouth bemoaning the death of Lasantha and the stifling of the free media, has today isolated that same media unable to stomach its insistence that the UNP needs to transform and reform itself and that Wickremasinghe is clearly not the candidate to do the job. In fact, so bankrupt is the party that the political reality is that the UNP needs to keep the Fonseka factor alive hanging onto what only a party bereft of policy and leadership believes is a trump card. The very man Wickremasinghe accused of killing Lasantha Wickrematunge and who he said was not fit to even command the Salvation Army. No less than 20 MPs on Friday January 9, 2009 were camped in the well of the House in front of the Speaker’s chair, seated cross-legged and adorned with red and black shawls, calling the government ‘murderers’ over the killing of Lasantha Wickrematunge. Today, none of them will mouth his name. In fact exactly one month after Lasantha was murdered and the UNP had organised a mammoth funeral, printing banners and posters denouncing the government for his killing, not a SINGLE one of them – not even those who professed to be his closest friends in the UNP attended a candlelight vigil by his grave on February 8, 2009. Within one month he was forgotten. No longer useful for the UNP to score brownie points. I recall the words of D. B. S. Jeyaraj when he wrote in May 2009, “the United National Party in Sri Lanka has neither been United nor truly national in recent times. Given the internal turmoil and external unpopularity some feel it may soon cease to be even a party.” How very prophetic and true. On Lasantha’s third death anniversary I also recall the words of Mangala Samaraweera. In 2009, Samaraweera was the Sri Lanka Freedom Party People’s Wing leader. Following Lasantha’s assassination he said that Wickrematunge had an audio recording of a confession made by one of the members of the killer squad led by the ‘Ugly American’ and a court injunction against Wickrematunge was obtained to prevent him revealing those facts. Addressing a press conference of joint opposition MPs, Samaraweera charged that the same persons assassinated Wickrematunge. Wickrematunge was known for taking governments of all hues to task. He was a harsh critic of the Mahinda Rajapaksa government, and had been locked in a legal battle with the president’s brother, Defence Secretary Gotabhaya Rajapaksa who was spearheading the battle against the LTTE, a terrorist group as designated by the US State Department. Coming after numerous killings of anti-government and other journalists such as P. Devakumaran (stabbed May 2008), Sampath de Silva (shot April 2006), Taraki Sivaram (abducted near police station, 2005) – the murder of such a prominent journalist and political figure was widely condemned across the world. The Editors Guild held the government responsible for the killing as it has failed to stop attacks against media personnel. The government also expressed shock at the killing, pledging to do everything in its power to catch his killers. Wickrematunge had been on Amnesty International’s endangered list since 1998, when anti-tank shells were fired on his house. Despite intense media pressure, no one has been arrested as of January 2012. It is clear that the murder investigation may end up as a cover-up, and that safeguards for an independent media appear bleak. This is all allegations without proof. If anything against the great General Sarath Fonseka could be unraveled this dastardly govt would have used that to utmost advantage against the General. Did the abductions and killings stop after incarceration of General SF? Answer to this is evident to whom in the defense establishment involved in these abductions and killings that to continue unabated to this day. If General killed Lasantha, by now he may be in the line up to gallows. Sarath Fonseka and Gothapaya Rajapaksa adopted the same terror tactics which were used by the LTTE, to deal with the LTTE. Both of them are capable of doing extra-judicial killings and other war crimes and deserved to be at the Hague to face the justice.Incidently, it is now Fonsekas turn to be in the prison. It is not the question of if but when for Gotha. Anything goes in a tinpot democracy. AFTER ALL FONSEKA IS A LOOSER BECAUSE HE SERVED 4 DECADES IN THE MILITARY & ONLY MAHINDA MADE HIM CHIEF. AS SOON AS “PRABA” GOT KILLED, FONSEKA BECAME LIKE A STAR & HE WANTED TO SIT ON MAHINDA’S SEAT HEHEHEHE. I BELEIVE HIS QUICK PRESIDENT DREAM HAS SENT HIM TO THE DOWN FALL OF HIS LIFE. THAT’S WHAT YOU CALL HIM A LOOOOOSER !!!! I do not agree. I was told, when India pushed Rajapaksha to STOP the war agaist LTTE, SF and Gotabaya only pushed Mahinda back to not to do it. As a nation we should have gratitude for that. YES THIS IS THE SINHALESE ONE AND ONLY COUNTRY, OTHERS MUST OBEY THEIR RULES LIKE WHEN THEY GO TO OTHER COUNTRIES AND DO. REMEMBER WE FOUGHT WITH CHOLAYO PANDAYO DEMALU, KERALU, PRUTHUGEESE UN , DUTCH , ENGLISH, KOTTI AND WILL WITH ANY OTHER COMING UP NEXT…. Act 4 Scene 3 of “SATAKA NATAKA”. At a time of Sri Lankan civilsation…MR, GOTA, SF Combination was a blessing in disguise to save the country. Prasies were aplenty ! In a country where no body dared to walk 20meters at a stretch without having to look back who is coming behind with a load explosives, when the next bomb explodes, without finding cover behind every tree and bush… It is amazing to note how many “TRUE TO THE BOOK”, Journalists, democrats, socilists, patriots have sprung up now and making all sorts of noises about injustices, barbarism… you name it. Not justifying killing of any nature…. but have a heart to appreciate the good things as well, before condeming left to right. After all, how true what Prabakaran said about Singhalese. we all knew these matters over 50 years.this country will never can fixed with rule of law and law in order.there is only way you can live like a dog and kissing the corrupted political leaders and wear-ship them day and night.do not go to court for justice ,do not criticize any wrong doing ,remove photo of lord Buddha, Jesus and Mohammad from you home ,replace by corrupted political leaders;s pictures.just live like dogs in this nation.we all call investigation and justice when police,judiciary is fully politically motivated and corrupted under the hand of dirty political animals who expect justice? you all can write thousand of articles but same way this nation will go,this was happen from 1948 until today.no matter you are second class citizen any where in the world just live the place you have basic justice and human right when the supreme court singed the judgment written in temple tree with attorney general office for my matter ,I decide to leave this country for ever.do you expect any reasonable justice from fully politically corrupted judiciary system of this country? what investigation you are expecting?what justice you are expecting under jungle lawless nation?you have thee choice 1.accept all animal nature of the country and live like dogs until you die(2)fight to death but not the way JVP did (3) leave from this lawless place live any whre in the world even not as second class but third class citizen and die .dear you have choice do not expect next UNP leadership to get thinks are better. finally I still say never forget great human being like lasantha . There is another side of Mr.Sarath Fonseka the government, the president or the secretary of defence never questioned or even if proved would never acknowledge. If you could write a investigative article on this I would highly appreciate it. As a sinhalese I whole heartedly approve the crushing of terrorism and since I was a child I wished for a united Sri Lanka without terrorism and racism.Also I do not question the methods used against terror. And I am sure the final offensive against LTTE must have been the result of same patriotism Mr.Sarath Fonseka and the Secretary of Defence share. After the these bomb attacks both secretary of defence and Sarath Fonseka must have been driven on by the vengeance on the man who wanted them dead and I believe both these people wanted the same.Also all three knew the one who does it first wins. So during the war Sarath Fonseka was ready to sacrifice anything or anyone’s life to reach his objective and defence secretary was aware of this, and actually defence secretary used it to serve his own cause. The result was Sarath Fonseka using brute force rather than a sophisticated strategy against the LTTE. While Admiral Karannagoda and Air Marshal Gunathilake stuck to a policy of lowest possible casualties of our own soldiers and civilians and to a rather more tested and proven and conventional tactics, Sarath Fonseka commanded the army with no or very little consideration about the casualties. And he experimented with tactics. For example while Admiral Karannagoda stuck to the more proven strategy of attacking the enemy’s weakest point Sarath Fonseka formulated his own strategy to attack the enemy’s strongest point. The result was while the casualty rate of the navy and the air force, although higher compared to peace time, were significantly lower than that of the army. I accept that during the war the the casualty rate of the army should be higher, but there should be consistency of the trend of the change of casualty rates of all three forces during peace time and war. My point is the army suffered a heavy casualty rate unnecessarily due to the strategy of Sarath Fonseka. And I believe he is responsible for all these invaluable lives of innocent soldiers. As far as I am concerned this is the reason for which he should be punished. Not for Hi-Corp or anything else.But for sacrificing so many lives of sons and daughters of innocent parents. But the funny part is these innocent parents of these soldiers do not know that their children died unnecessarily because of Sarath Fonsekas military strategy. They do not understand that Sarath Fonseka sacrificed the lives of their children without any concern so that he can avenge Prabhakaran. So these innocent people voted for Sarath Fonseka and treat him like a hero. And try to free him from the jail. Because they do not know the truth. If Sarath Fonseka was an exaggerated and prejudised supporter of Sinhala Buddhists, why did the Sunday Leader extend such an unusual patronage and support for such a chauvinist . Considering the financial predicaments it faced it, betrayed its lofty policies ..The reasons Sundzau Leader now adduced for change of it s policy is far from true.SF deserves to suffeer for his dangerously immaturedecisions and Padinkkan Mouth.He is undoubtedly a genuine amilitary genius responsibel for the country’s Victory. Ranil is another Gobbles.in different garments. He kept SF as a baoit (Billa) , when he could not face P/elections, His support to release SF is not bourne of genuine thoughts, but only becasue he wants SF in the lime light to keep the emacipated UNP Legs and Tails dangling and kicking.